Trevor Nunn last directed theatrically released movie was 1996’s Twelfth Night Or What You Will. It was a box office bomb making only 1/10th of its budget back in the US. 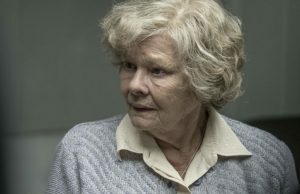 Red Joan will likely fare better with Judi Dench playing Joan Stanley, a woman arrested as a KGB spy during WW2 and the beginning of the cold war – but not until 2000 when she was an old woman. At least, that’s the trailer pitch and the reason why many people will flock to see Red Joan. What’s here instead is a rather banal period romance starring Sophie Cookson as the 1940’s version of the character and her brushes with archetypal men, from the kind, safe and older British scientist to the dangerous socialist revolutionary boy. Sure, Judi Dench is in the movie. Perhaps twenty minutes? She bookends some chapters while also slowly revealing the case being built against her. If you take the 2000 Dench-era parts, you have a fairly solid (if oddly bent toward romance genre rather than the spy thriller genre) period story of a woman arguably betraying her country. The movie has an opinion about this that only makes sense with the benefit of hindsight. This movie was a disappointment to say the least. I’m happy to watch a WW2 period romance movie, but not one disguised as a spy thriller that leads to the interrogation of Judi Dench at its center. It’s also an unfair ploy to stack the deck so the audience sides with Judi Dench because she’s Judi Dench, and not because of the actual character who is based on an actual traitor. I don’t give movies a review score, but if I did, this one would be a disapproving picture of Maggie Smith out of ten.